Not so long ago, Fine Art Shippers opened a new representative office in London, making our artwork shipping services even more accessible and convenient to our clients from the United Kingdom. Located in the Heathrow Airport area, it provides gallerists, art dealers, artists, collectors, and auction houses with an excellent opportunity to ship antique and fine art pieces in the safest and fastest way possible. Moreover, in addition to our comprehensive artwork shipping services in London, we also offer professional art handling, packing, crating, installation, and storage services to ensure that our clients have the best shipping experience ever. 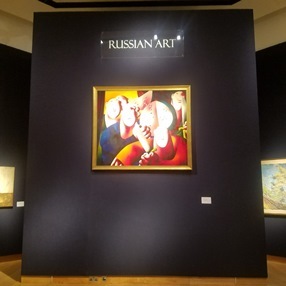 While being in London this month, Fine Art Shippers was happy to meet really great people, establish new contacts, expand partnership relations, and certainly visit many reputable galleries and auction houses during the amazing Russian Art Week. 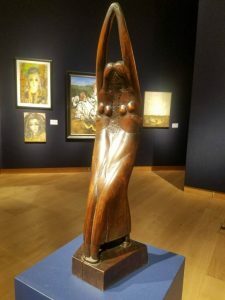 In particular, our New York team of artwork shipping professionals attended Bonhams, Christie’s, and Sotheby’s sales to see truly unique and very valuable works of art by Russian masters. 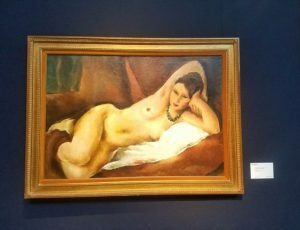 There were many masterpieces put up for sale during Russian Art Week in London. However, our favorite one was “Portrait of group with watermelon,” an impressive painting by a Russian nonconformist artist Oleg Tselkov, known for his unusual images of faces in bright colors. It was sold at Christie’s Russian Art Auction for £187,500 (approx. $248,160). 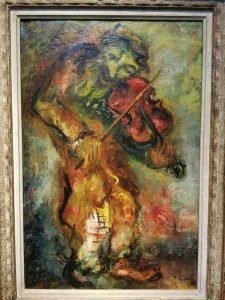 Another highlight of the sale was “Le vieux violoniste” by Issachar Ryback, a well-known Ukrainian-French painter, sculptor, and art critic. The painting was hammered for £18,750 (approx. $24,800), exceeding its high estimate of £18,000 (approx. $23,800). 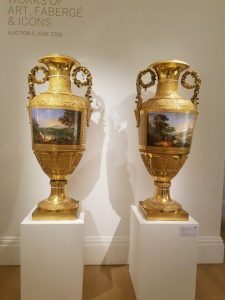 As for Sotheby’s Russian Works of Art, Faberge & Icons Auction, our team of artwork shipping professionals was impressed by a pair of monumental gilt-bronze porcelain vases created in 1825 in St. Petersburg. Painted with a beautiful landscape view and decorated with friezes comprising rosettes, anthemia, acanthus, and arches, they are true masterpieces of Russian Imperial art. Here are several photos of the mentioned above and some other works auctioned at Christie’s and Sotheby’s London sales. Fine Art Shippers is very happy to expand our gallery and auction shipping services to London, and we are looking forward to applying our skills and experience in the United Kingdom. Besides, you will be surprised to know that all our professional artwork shipping services are very competitively priced, so do not hesitate to request a free quote from us to ensure you are getting a good rate!